Starting off this Christmas cracker of an album is ‘Chart Breakers: Pop’, which features some of the hottest tracks around at the minute, including ‘Sweet Nothing’ from Calvin Harris (feat. Florence Welch), ‘I Found You’ from The Wanted and the smash ‘Million Voices’ from Otto Knows. Kicking off the Triple Trackers a little early this issue, we head straight into a Madness trio which includes their hits ‘Cardiac Arrest’, ‘Our House’ and ‘Michael Caine’. An unusual mix is up next, the ‘Rock The Country Party’ selection, which features 10 honky tonk tracks including ‘Footloose’ by Blake Shelton, ‘Crazy Little Thing Called Love’ by Dwight Yoakam and ‘Hillbilly Twist’ by Wild Rose. ‘Just Great Number Ones’ swoops in after with some big hits from the last few months, including Heatwave from Wiley (feat. Ms D), ‘Don’t You Worry Child’ from Swedish House Mafia and the unexpected number one from Psy, ‘Gangnam Style’. The second, and last, Triple Tracker of the issue is from Adele and includes her popular singles ‘Rolling In The Deep’, ‘Someone Like You’ and the James Bond theme ‘Skyfall’. ‘More Teenage Kicks’ features tracks that will definitely take partygoers down memory lane, including ‘Down In The Tube Station At Midnight’ from The Jam, ‘No More Heroes’ from The Stranglers and ‘Sheena Is A Punk Rocker’ from the Ramones. Rounding off CD1 is ‘A Swingin’ Christmas Party’ which includes some much-loved classic crimbo tunes from the likes of Dean Martin, Kay Starr, Frank Sinatra and the wonderful ‘Santa Claus Is Comin’ To Town’ from Tony Bennett and The Count Cassie Big Band. ‘Gangnam Style (Christmas Mix)’ finishes off CD1 from the Korean wonder Psy. We get back into the groove now with CD2, kicking off is ‘Commercial Dance’ which features remixed versions of today’s hottest sounds. Tracks include ‘DNA (Kat Krazy Extended Mix)’ from Little Mix, ‘Close Enemies (Extended Mix)’ from Example and ‘Sweet Nothing (Extended Mix)’ from Calvin Harris (feat. Florence Welch). It’s time for some smooth RnB next with the following two mixes, ‘Featuring Jay-Z’ and ‘Chart Breakers: Urban’. Jay-Z’s mix contains 10 of his biggest collaborations including ‘Heartbreaker’ with Mariah Carey, ‘Talk That Talk’ with Rihanna and ‘Numb/Encore’ with Linkin Park. ‘Chart Breakers: Urban’ also includes some top tracks, ‘Beneath Your beautiful’ from Labrinth (feat. Emeli Sande) and the emotional ‘Don’t Judge Me’ from Chris Brown. We head back into party land now with the ‘Club Classics 2’ mix which features some old school smashes. Livin’ Joy kicks it off with ‘Dreamer’ before going into ‘It’s Like That’ from Run DMC vs. Jason Nevins, other tracks include ‘Good Life’ from Inner City and ‘Freed From Desire’ from Gala. 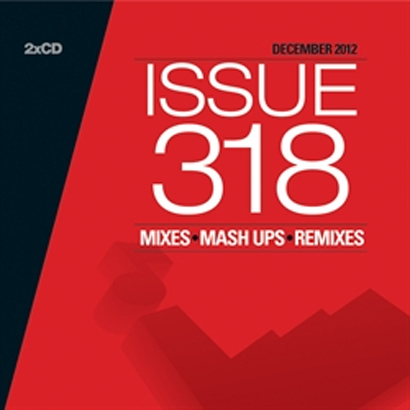 Issue 318 is available from Mastermix now priced at £18.38.